Maze Runner: The Death Cure comes four years after the release of the initial film in the franchise. The Maze Runner opened in September of 2014, during the height of the young-adult (YA) craze, rivaling The Giver and Divergent. The sequel (Scorch Trials) hit theaters promptly a year later, but unlike the first movie, it was met with harsh criticism. Because of the film missing the mark with critics and movie-goers, the third and final installment was set to release in February of 2017. However, the star of the franchise, Dylan O’Brien, was seriously injured during a stunt after only three days of filming. The production was shut down, and there were serious doubts that The Death Cure would ever be finished. Luckily, O’Brien was able not only to overcome his injury but also managed to complete the film. The incident happened in March of 2016, and nearly two years later The Death Cure has finally arrived in theaters. The story? Thomas (O’Brien) and the other Gladers embark on the journey to find the cure for the wide-spreading virus known as “the flare.” With the help of some unlikely individuals, the group plans to invade “The Last City,” take down WCKD and save the rest of humanity. 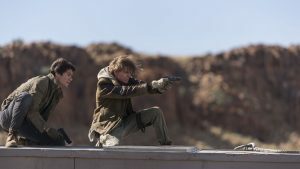 Director Wes Ball, who also made the previous two installments, seems to accept that The Maze Runner franchise isn’t much different from the rest of YA movies as he appears to embrace the generic tropes and formulas that we’ve seen all too often. Simply, we’ve been there and done that. The most daunting element of The Death Cure is the run-time: 144 minutes. Granted if the near two-and-a-half-hour movie was consistent all the way through that’d be one thing—but it wasn’t. Instead, the film feels bloated and slowly creeps towards the ending we predicted an hour into the picture. However, the movie isn’t a total bust. There are moments of intense action and solid set-pieces. But, they never are able to connect these moments of combat and suspense with characters and plot. In other words, it’s a lot of sizzle but not a lot of steak. Overall, The Death Cure was a mediocre ending to a series that offered both a great and terrible installment. Only makes sense that the concluding chapter was somewhere in the middle.